Buying a balance bike for a 5 year old can be difficult as many balance bikes tend to be aimed at the 3 to 5 age group and by age 5 there will be little growing room in the bike. Having said this, there are still quite a few options. A balance bike is a great for many 5 years olds. It cuts down the amount of time it takes to teach them how to ride a pedal bike as they learn the balance instinctively on a balance bike.If your 5 year old has siblings this can make the job of buying one a bit easier. As you could still buy a bike that is aimed at 3 to 5 year olds. Your 5 year old could use it enough so he or she is ready to transition onto a pedal bike. Then the balance bike could be passed onto a younger sibling so you still get the value from the bike. 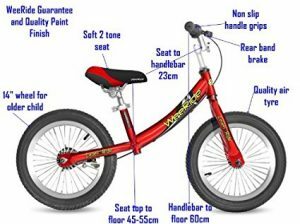 The type of balance bike which would be suitable for a 5 year old will be dependant on the measurement of their inside leg. These measurements will make a big impact on whether to get a balance bike with 12 inch or 14 inch wheels. The most important thing is to consider their inseam (inside leg) measurement. You can measure a child’s inseam by measuring from the top of their crotch to the floor. See picture for how to measure an inseam. 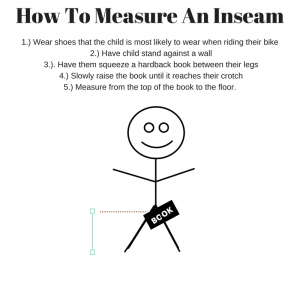 The inseam is an important measurement as it will help you determine the seat height on the balance bike that your child needs. The seat height should be an inch (2.5cm) less than their inseam. It’s very important that the child’s feet can touch the floor flat on the ground so they can scoot along on their bike. When looking at the seat height of the bike you are buying for your 5 year old, you want to make sure that you can adjust the seat height upwards from what your child currently needs. Generally look for a couple of inches (5cm) of growing room if you want the bike to last a while. This will make sure they can use the bike for a year or two. 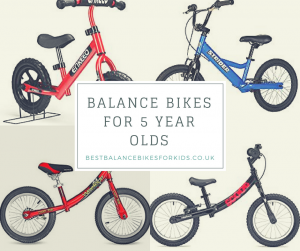 ​If you have a 5 year old on the smaller side it may also be worth checking out the balance bikes for 4 year old kids as this has some options with 12 inch wheels which may be suitable. If they have an inside leg measurement of 52cm or more, it may be worth checking out the Strider 16 inch balance bike which is featured on our article on balance bikes for older children. There are also some other ideas of how you can get your child to learn to balance on a pedal bike without actually buying a balance bike. ✔️ Summary - It's important kids can put their feet flat on the floor when sitting on a balance bike in order to push the balance bike along. Determine the correct seat height for your child by taking off 2.5cm from their inseam (inside leg measurement). Example: An average 5 year old has an inside leg measurement of around 49cm. Take 2.5cm off this measurement and the minimum seat height for an average 5 year old will be 46.5cm. 5 year olds differ hugely in size, so take their measurement before making a purchase. If the 5 year old has younger brothers and sisters it may be worth investing in a balance bike as once they have finished with it they can pass it onto siblings. Or you can have a bike that they take turns in using. If they are sharing with a sibling look for bike which has a seat height with a quick release clamp so it's easily adjustable. Look for a used balance bike. Try ebay or other places to search locally. Sell the balance bike once your child has finished using it. The Ridgeback Scoot balance bike is aimed at 4 to 8 year olds. The bike comes in different colors (including bikes with pink and yellow seats) and has some good features for older kids. There aren't many balance bike with wheels which have 14 inches but this is one of them and will be the perfect size for many 5 years olds. It's an especially great compromise if you're not sure whether to go with a 12 or 16 inch balance bike. Both the handlebars and seat adjust. The seat has a height adjustment from 40 to 55 cm. Remember the seat height should be slightly less than their measurement of a child's inseam so that they can get on and off the bikes easily. The handlebars adjust from 53 to 58cm. So you should be able to adjust the bike to suit your 5 year old child. It weight 5.6 kg which should be fine for most kids this age to control and manoeuvre. It also has pneumatic tyres which will give a bit more traction than other EVA foam or rubber tyres featured on other balance bikes. ✔️ Weight of bike - When buying a balance bike for a child, it's often recommended that the bike weighs no more than 1/3 of a child's weight as a lighter bike is easier for them to control. This guideline matters less as children get older, bigger and stronger. However a lightweight bike is still easier for them so it's something to bear in mind. Example: an average 5 year old weighs 18.1kg, so ideally a bike around 6kg or less is a good choice. The Weeride balance bike is a great option for 5 year olds with a higher seat height range than most of the balance bikes on the market. The bike has a 14 inch frame and 14 inch wheels. The lowest seat height is 45cm and the hightest is 55cm. It weighs 5kg so is lightweight making it easy to control for young children. It has a rear band brake with easy touch brake lever. Although many kids will stop a balance bike with their feet, it's good to have the option of a brake to use. Using a brake will get them used to the idea for when the graduate onto a pedal bike. The air filled tyres offer a smooth ride and good traction. ✔️ Brakes - Balance bikes for very young children don't tend to have brakes as young children find them difficult to use and they will instinctively use their feet instead. However, by age 5 most kids have the necessary co-ordination to use a brake and it's good for them to get used to when they transition onto a pedal bike. It saves scuffing their shoes too. However not all bikes have them, like the Early rider kids bike below but they're worth considering. This is a lightweight bike that has a recommended age of 3 to 6 years old. It has the lowest seat height range in this article of between 37.5cm and 47.5cm. The seat height required will be an inch less than a child's inseam. It's worth having a bit of growing room on the bike. So, if possible the maximum seat height should be a least a couple of inches more than the child's inseam to accommodate them for a little while. The air filled tyres offer a smooth comfortable ride and will absorb the impact from any bumps along the road. This bike is expensive but it's top quality, stylish and well built and will definitely last through siblings. So it could be a good investment to pass onto the next child in the family (if there is one). The drop handlebars give the balance bike a grown up feel which could be good for a 5 year old. Strider bikes have two options which could suit a 5 year olds. The first is the Strider Sport which is aimed at 18 months to 5 year olds. If you have a smaller 5 year old it could be worth choosing this option as they will probably be able to get quite a bit of use out of it. It could also be passed onto a younger sibling or cousin. Alternatively sell it on ebay to recoup some of the cost. The other Strider bike is the 20 inch bike. This is aimed at the 6 to 10 age group but could be a good option for a taller 5 year old. Measure their inseam and check before purchasing. The lowest seat height on the Strider is 28cm (11 inches). This extends all the way up to 49cm (19.5 inches). So the bike would be suitable for 5 year olds who have an inseam of 46.5 cm or less. As the seat height goes so low it could also be a great bike for sharing with a younger brother or sister. Strider bikes are excellent quality and built to last. They are one of the leading brands in the balance bike world so if the measurements are correct for the child in question, it's difficult to go wrong. There is no brake. The bike is super lightweight at 2,9kg which makes it easy to control for little kids. It is also light to carry when you want to store it somewhere and they have had enough. The lowest seat height on Strider 16 inch balance bike is 49.5cm so it would suit kids with an inseam of The seat height goes up to 65cm so is likely to last 5 year olds for a very long time if they need it. An advantage of the 16 inch balance bike over the Strider sport is that it has front and rear hand brakes. It's good if older kids can get used to using a hand brake rather than using their feet to stop. This will help when they transition onto a pedal bike. It will also save scuffing their shoes! Another advantage of this bike is that it has pneumatic tyres. This means the bike is much better over different terrain. It offers a smoother ride for kids as well. As the weight of children increases, the rubber tyres which are fine for younger children cannot take the extra pressure of the weight of older kids so air filled tyres are better on balance bikes as kids get older. The Enkeeo 12 inch balance bike is aimed at kids from aged 2 to 6 years. It has a seat height of up to 45cm so will be suitable for 5 year olds who have an inseam of 42.5cm or less. The minimum seat height is 35cm so there is 10 cm worth of growing room if there are other siblings who might want to use it. It also features EVA puncture resistant tyres.